While writing a program, there may be a situation when you need to adopt one out of a given set of paths. In such cases, you need to use conditional statements that allow your program to make correct decisions and perform right actions. The following flow chart shows how the if-else statement works. Try the following example to understand how the if statement works. There is nothing special about this code. It is just a series of if statements, where each ifis a part of the else clause of the previous statement. 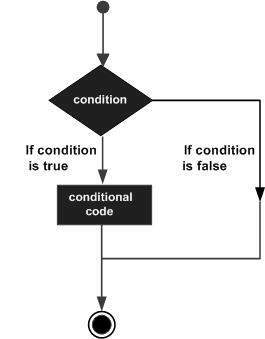 Statement(s) are executed based on the true condition, if none of the conditions is true, then the else block is executed.